The Texas Bank and Trust Student Board of Directors applications have arrived on campus at Brook Hill! The TB&T Student Board is a prestigious program recognizing outstanding high school seniors in the community. Seniors Peyton Adams, Ini Adeleye, Kasey Anderson, Sharon Chai, Sharad Doshi, Colton Drennan, Jane Kim, Conner Livesay, Alvin Ugo Mgbemene, Margaret Newman, Kammy Okaro, Justin Powell, Denise Tan, Zoe Ward and Hannah Windsor joined students from other area high schools to serve as this year’s Student Board and we are looking forward to the naming of the 2019-2020 Board members. Established in 1978, Student Board remains the bank’s first and most enduring financial literacy program. Students are selected based on their grade point average, extra-curricular activities, and after school work activities. Students must submit an essay with their application as well as two letters of recommendation from either a faculty member or administrator to be considered for the program. 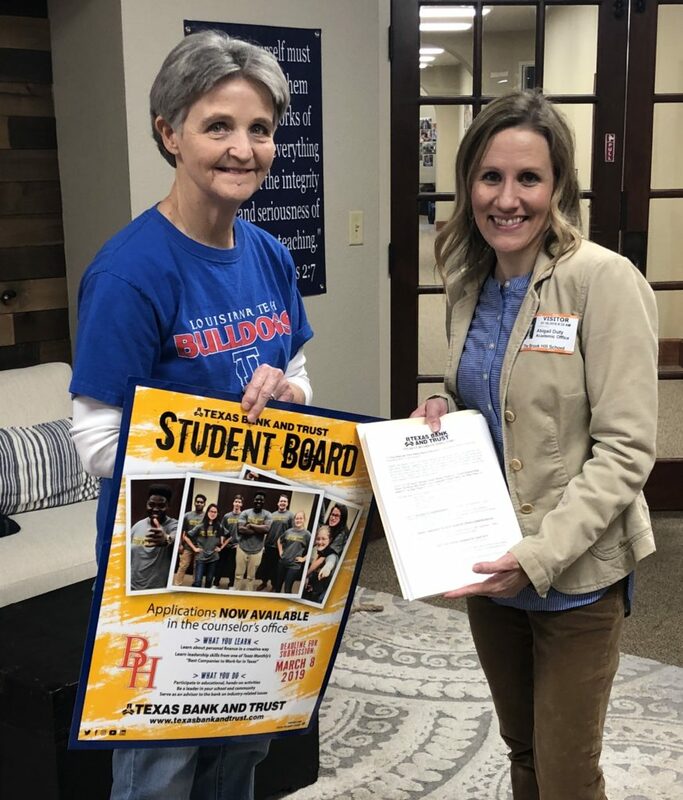 Students accepted into the 2019-2020 Student Board program will be notified in late May. Since its inception, the Student Board has introduced more than 2,200 high school seniors to banking and money management. Applications for Seniors 2020 are available in the Academic Office at Brook Hill!